Baldness is the state of missing hair where it usually grows, especially - the head. The most "famous" form of baldness is a progressive hair thinning condition which is called androgenic alopecia or 'male pattern baldness' that tends to appear in adult male humans and other species. The severity and nature of baldness can vary greatly; it ranges from male and female pattern alopecia, alopecia areata, which involves the loss of some of the hair from the head, and alopecia totalis, which involves the loss of all head hair, to the most extreme form, alopecia universalis , which involves the loss of all hair from the head and the body. The term "common baldness" usually means male-pattern baldness, or permanent-pattern baldness. 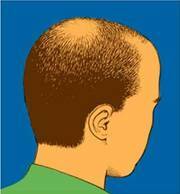 Male-pattern baldness is the most common cause of hair loss in men. Men who have this type of hair loss usually have inherited the trait. Men who start losing their hair at an early age tend to develop more extensive baldness. In male-pattern baldness, hair loss typically results in a receding hair line and baldness on the top of the head. Women may develop female-pattern baldness. In this form of hair loss, the hair can become thin over the entire scalp. A lot of things can cause excessive hair loss. For e.g. stress, illness, surgery, hormonal imbalance, hair or scalp infection, some medicines (like anticoagulants used for gout, chemotherapy, cancer), excess vitamins, birth control pills, antidepressants etc. One of the main reasons for hair loss in men is the formation of Dihydrotestosterone, a male hormone. Once formed, Dihydrotestosterone binds to the hair follicle, retards growth and cuts off blood supply to the follicle. Hormonal problems may cause hair loss. If your thyroid gland is overactive or underactive, your hair may fall out. This hair loss usually can be helped by treatment thyroid disease. Hair loss may occur if male or female hormones, known as androgens and estrogens, are out of balance. Any style of yoga will help reduce stress; however, the most effective for stress reduction is Hatha and Kundalini yoga. Both yoga styles incorporate asanas and mediation. The asanas will relieve tension throughout your body. Meditation will help relieve tension in your mind. Mediation will probably be the most effective in relieving stress that may help in reducing your hair loss. Yoga postures can help you overcome stress, anxiety, and indigestion, poor blood circulation in head, which are considered as main causes of hair loss. Headstand yoga pose can be very helpful as it contributes blood circulation in head as well as relieves tension. Yoga also helps to increase self-awareness, enabling you to address physical symptoms before they become severe. Ushtra means a camel. In this asana almost all the limbs of the body are arched like those of a camel. So it is called Ushtrasana.The Camel Yoga Pose helps stretch the front of the body including the chest, abdomen, and quadriceps. It improves spinal flexibility. It is best to practice it later in your asana routine after most of the muscles are limber and you have worked the back and shoulders. This pose controls breathing and constricts the chest and the entire body, adding flexibility to the spine. To come into this posture, position yourself on the ground on all fours, knees under hips and hands in front of your shoulders. Inhale, bringing head and tailbone slowly upwards. Exhaling, rise from the floor with your knees bent. Straighten your arms and legs, but keep your head lowered. Hold this pose for 30-60 seconds, continuing to inhale and exhale throughout. This yoga pose is for thyroid & parathyroid glands, located in the neck region, since due to the firm chin-lock in sarvangasana their is increased fresh blood supply to this glands. This ample supply of blood increases their working efficiency. These glands regulate protein, carbohydrate and fat metabolism, affecting how human cells use energetic compounds. A simple posture, the crocodile pose is relaxation posture. While doing this posture, the body resembles a crocodile, thus, it�s known as the crocodile pose. �Makar� is the Sanskrit word for crocodile. A relaxation pose, Makarasana is done between other yoga pose to relax the body and calm the mind. For those who cannot lie on their back because of medical reasons, can do the crocodile pose to relax instead of the corpse pose. • Start lying on belly, feet turned out. • Bend your elbows, holding onto opposite elbows and placing your elbows on the floor forward from your shoulders. Drop your forehead to your forearms. Your chest should be off the floor and your head should comfortably reach your forearms, while your neck and shoulders remain comfortable. Make any adjustments to the position of your arms that you need to make. • Begin breathing deeply into your belly, breathing through your nose. Your belly should press against the floor as you inhale and relax as you exhale. This provides a gentle massage to your internal organs, helps strengthen your diaphragm and helps to stimulate circulation throughout your torso. • Stay in this position for 8-10 long, slow belly breaths. • Release your elbows and press back to child's pose or come up to sitting. • Lie on your back with legs and arms straight, feet together and palms on the floor beside your body. While exhaling, raise your legs slowly upto 90 and then the whole body and the rest your weight on the arms so that the chin touches the jugular notch. Bring the arms and hands to support your body at the hip region (fingers at the back and thumb in front of the body). The entire weight of your body rests on the head, neck and shoulders while the arms are used for balancing. Keep the trunk, legs and hips in a straight line and as vertical as possible Focus your eyes on your toes, with your chin pressed against the chest. Retain the posture for one for three minutes. While exhaling, return to the lying position by bringing the leg backward and releasing the hands and the palms. • Take prone lying position, legs together, hands straight by the side of the thighs, chin resting on the ground. Fold the legs at the knees and bring them on the thighs. Knees must remain together. • Bring your hands backward and hold the toes of respective legs from the thumb and forefinger of the respective hands. • Raise your legs a little up and simultaneously raise your head and chest. • Holding the toes pull the legs towards ears and bring the toes near the ear. Gaze in front. Ustrasana is a hatha yoga posture, found in similar form in most of the styles of yoga. It is a very deep backward bend performed in a kneeling position. If executed perfectly it can act as a stimulant for the abdominal organs, relieve menstrual pain, fatigue and indigestion, and ease back aches and pains. • Sit in Vajrasana i.e. squat on the floor, toes pointing backwards. • Now, stand on your knees with arms at the sides. • Spread knees about half a foot apart. • Bend your body backwards and hold your ankles with both hands so that you end up looking at the ceiling. • Push the abdomen forward as much as possible keeping the thighs vertical. • Return to the starting position, slowly releasing the hands from the ankles, one at a time. • Return to Vajrasana and relax breathing normally. • As with all yoga, make sure to monitor and steady your breathing. • Avoid this pose if you have any serious injury to your lower back or neck. Halasana is a yoga exercise of more or less same variety as sirsasana and sarvangasana. The stretching movement gives an additional benefit in making you flexible and strengthen your spine and back muscles. It is helpful in curbing indigestion, constipation and acid reflux which is very common and very irritating disorders and cant let you to perform your work normally. • Lie on your back inhale to your fullest and lift your legs and trunk first to 30 degree, then 60 degree and finally 90 degree just as in sarvangasana, then take your legs back of your head making it 120 degree and beyond, this process should be done while exhalaling. • Now rest the toes on the ground behind the head and breath normally, you can use hands on the back for support but ideally both in sarvangasana and halasana hands should be on flooe, palms touching the floor. • When acquiring the posture of halasana the legs should be at 30 degree from the floor. • Same process is done in reverse order while returning to normal position. Yoga is the primary level which consists of bodily exercises to build a ground for Meditation. The word yoga had been derived from the Sanskrit word yuj which means to join to unite to balance or to integrate. Yoga is a system of exercises for the mental and physical well being. It combines stylized poses with deep meditation and breathing. According to Patanjali, within the human body there are channels called Nadi and centers called chakra. According to astrological reports for yoga asanas the above mentioned asanas are said to be effective for those who come under the following zodiac sign .